A pewter tankard from English Pewter Company is a truly special and thoughtful gift for any occasion which shows someone special to you that you really care, and there are few tankards that are more beautiful and eye catching than this 9cm tall and 7.5cm wide option. This half pint tankard is designed in an Old London style to offer an unusual shape which is wider towards the bottom and then tapers in at the top. This interesting shape is then added to by horizontal line detailing and a beautiful curved Georgian handle that give the tankard its inimitable style and flair. Being composed of pewter, the tankard boasts a highly polished finish and will not tarnish and in fact often improves with age. Supplied in a cream and black presentation box that also proudly displays our historic beefeater logo. 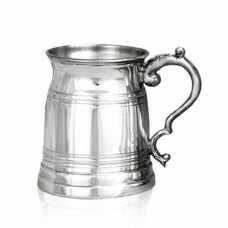 This beautiful heavy weight one pint pewter tankard is one of the most iconic and historically signi.. There are few tankards which evoke feelings of beauty, history and elegance better than this beautif..
Elegance and style often result from the simplest of designs and that is exactly what you find with ..
English Pewter Company is a world-renowned leading manufacturer of Pewterware. All our pewter items ..
All of English Pewter Company's tankards share the same high standards of craftsmanship and longevit..